Today's guest post once more comes to us from Lena Mosser, a PhD candidate at Eberhard Karls Universität. Lena's doctorate dissertation is on masters in the Royal Navy, and she brings that expertise to bear with this short piece. With all the fascinating new developments going on in eighteenth-century navigation, it is easy to forget that it was not all sextants and chronometers. 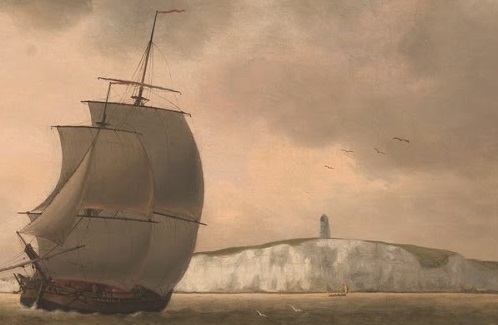 Even the best instruments and new techniques, even in the hands of the most experienced and skilled navigators, reached the limits of their usefulness once a ship was in coastal waters, which means that a considerable part of eighteenth-century navigation is actually better described as good old-fashioned pilotage. Pilotage demanded completely different skills and equipment of the practitioner than blue-water navigation: in coastal waters, what served a navigator better than any new-fangled instruments were a sounding lead, a good memory and a sharp-sighted lookout, as well as, of course, sailing directions. 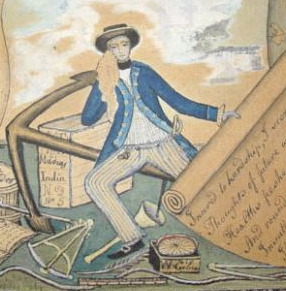 Detail from "Earl of Cornwallis Bound to Bengal,"
Courtesy of The Mariners' Museum and Park, Newport News, VA. Sailing directions have something decidedly ‘low-tech’ about them. The earliest written ones I have seen were used by ships of the Hanseatic League in the fourteenth and fifteenth centuries, but they are almost certainly very much older. They are descriptions, either written down or memorised, of distances, depths, landmarks and other topographical information for particular waters or sailing routes. In other words, sailing directions were pilots to take away and carry with you, even where live pilots might not be easy to come by. So we squared our main yard and up Channel did make. 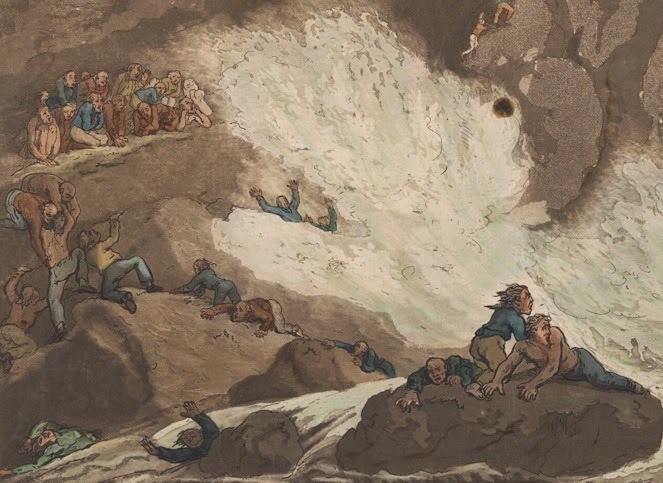 Foreland," Thomas Luny, 1780, Yale Center for British Art. I don’t know if these were ever actually used as sailing directions, or whether they mimic the real thing, but the detail given in them, with its references not only to landmarks but also to depths, composition of the sea floor, and hints at how to work the ship suggest that they were. Three leagues off shore lays Wadhams Isles. But still endeavour to weather them all. Halsewell," P. Mercier, S.W. Forbes, and Rawlinson, 1786, National Maritime Museum. These sailing directions had the reputation of being the best for the Newfoundland coast, and you can in fact follow them easily on a chart (I have not so far had an opportunity of running a field trial). Thus, despite their old-fashioned appearance, it is no wonder that sailing directions in general remained in use alongside all innovations in navigation, and are still in use today. Log of John Dykes, master, HMS Winchelsea, National Maritime Museum (Greenwich), Caird Library, LOG/N/W/1.